A cozy, homey room is the perfect space to relax after a hard day at work or to socialize with friends with a bottle of wine and a movie. Whether you want to create a more intimate feeling in a large room or transform a small room into a snug den, leather furniture is a good choice for creating that cozy feel. Combine leather with warm colors, plush fabrics and rich, dark wood to transform your room into an inviting, relaxing space. Paint the walls with soft, earthy fall colors. Chocolate browns, burnt oranges, deep reds and rich yellows create a feeling of warmth and security. For a more rustic "log cabin" feel, cover the walls with wood paneling and use accessories to introduce the fall color palette. Lay a thick, deep-pile carpet for a soft, warm feel underfoot. For a cozy rustic vibe, lay a wood floor with rich, deep hues and add rich, Persian-style rugs. Create an intimate seating area by arranging the smaller sofas or chairs at right angles to the largest leather sofa. Place a rustic, dark wood coffee table on a large rug in the center of the seating area. 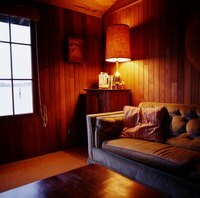 Add wood furniture with warm, deep undertones, such as redwood or mahogany. Search thrift stores, flea markets and antique shops for a bargain. In small rooms, use faux leather storage cube boxes. These are an attractive storage solution that complement the other leather items in the room and double as small side tables. Create a cute reading area by fitting floor-to-ceiling shelves in one corner of the room. Add an overstuffed leather chair, small antique table and Tiffany tabletop lamp. Fit dimmer switches to the main lighting in the room or use tabletop lamps for a softer, more gentle light. Use Moroccan-style lamps to add a touch of exotic warmth to the room. Pile cushions and throws on the sofas and chairs in a range of textures, fabrics and colors. Combine suede, leather, velvet, cotton and damask in fall-inspired colors. Add a splash of black to give depth to the color scheme and a touch of green for a really nature-inspired feel. Dress the windows with floor-length curtains made from a heavy fabric such as velvet. Although blinds are a common window treatment, they lack the soft, flowing appearance that makes curtains that much more cozy. Avoid whites and bright shades because they reflect light, creating a light, airy atmosphere. Avoid very dark hues since these can make a room feel depressing during the day without the warmth of artificial lighting. Avoid silky, shiny fabrics and opt for more textured types with a non-silky finish.